Cooking wouldn’t be the same without pepper, the almighty king of spices. Of all the varieties, black pepper (Piper nigrum) is omnipresent in kitchens throughout the world either in the form of peppercorns or as ground pepper. This Indian-born culinary spice is actually the fruit of a climbing plant and, although black in color, it is not yet ripe. When preserved adequately, black pepper can supply us with impressive amounts of essential nutrients such as vitamin K, manganese, iron, copper and magnesium. Overall, black pepper has an impressive nutritional profile, rounding up high amounts of almost all essential vitamins and minerals. However, considering the fact we consume limited amounts of the spice, our intake of essential nutrients from it is almost insignificant. However, black pepper also contains unique aromatic compounds with impressive health effects. The majority of the health benefits we enjoy from pepper consumption are actually a result of the aromatic antioxidant, anti-inflammatory and anticancer compounds occurring naturally in the spice. In addition to this, black pepper is known to have potent anti-inflammatory and antioxidant activity, protecting against free radical damage and chronic disease. Even more, a moderate consumption of the spice relieves flatulence, improves digestion and intestinal motility. Interesting facts about black pepper. Black pepper is the unripe, dried fruit of a tropical vine called Piper nigrum. The fruit of the pepper plant are arranged in a fashion that resembles cascading May lily flowers. Black pepper fruit are collected while still unripe, dried and used as culinary spice either whole, cracked or ground. Dried black pepper fruit are called black peppercorns. Unlike white pepper, for example, black peppercorns are used whole, meaning the dark skin, flesh and seed all add to the flavor of the spice. Each pepper berry contains one seed. Believe it or not, ripe black pepper is dark red in color. Chemical composition and health benefits of black pepper. Black pepper is a fruit, a culinary spice and an herb. Piperine is a compound found in the black pepper fruit, responsible for its hot spiciness. Other flavor giving compounds in black pepper include hydrocarbon monoterpenes such as sabinene, pinene, terpinene, limonene and myrcene. Besides giving flavor, these volatile oils actively contribute to the health benefits of black pepper consumption. For instance, ongoing research suggests that piperine may significantly increase selenium, beta-carotene and B vitamins absorption, all important nutrients required to keep in good health. For example, selenium is vital for thyroid health. An insufficient intake from dietary sources can impair normal thyroid function and affect the production of thyroid hormone, increasing the risks for hypothyroidism. Beta-carotene is a pigment and antioxidant with wonderful benefits for eyesight. Its antioxidant properties help filter harmful free radicals from light and protect against retina damage that could, in time, lead to cataracts and macular degeneration, or loss of central vision as a result of old age. Our body is also able to convert beta-carotene into vitamin A to meet its requirements, the nutrient being especially needed for good immunity. The fact that piperine enhances beta-carotene absorption makes pepper a great element for eye and immune system health. B vitamins are vital for digestive health not only because they contribute to protein, carbohydrate and fats synthesis, but also because they help maintain the health of gut microbiota, good bacteria in the intestines that helps ferment food, synthesize certain vitamins and dietary minerals, absorb nutrients from digested food and contribute to the immune response. By helping increase B vitamins absorption, the piperine in black pepper contributes directly to digestive health, but also immune system function. The flavor-giving compounds in black pepper promote digestive health in more ways than one. A regular, yet moderate consumption of black pepper is said to aid digestion by increasing motility and gastric enzymes secretion. Intestinal motility refers to the spontaneous contractions that help move food through the digestive tract. Eating foods that encourage intestinal motility is beneficial for colon health because it stimulates regular and frequent bowel movements, relieving constipation and limiting the time the colon is exposed to toxic waste material. 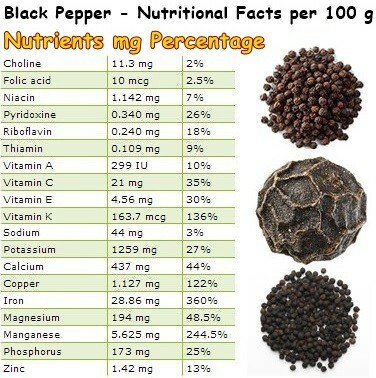 If you take a look at the nutrition table above, you will notice that black pepper is an excellent source of vitamin K, iron, manganese, copper, magnesium and calcium and a good source of B vitamins as well as vitamin C. According to its nutritional profile, black pepper contributes immensely to bone health. The high percentage of vitamin K (136%) means that black pepper increases calcium absorption in bones, prevents bone frailty, osteoporosis as well as atherosclerosis (calcium and plaque deposits on artery walls). A diet containing vitamin-K rich foods such as black pepper thus promotes cardiovascular health. Black peppers boasts great anti-inflammatory properties due to its significant vitamin C and vitamin K content. Being rich in iron, black pepper is recommended for those suffering from anemia as well. Not only will it help with adequate tissue oxygenation, but it is a flavorful tool in fighting anemia. Women, teenagers, workout enthusiasts and passionate coffee drinkers should consider increasing their intake of iron-rich foods, not necessarily black pepper. With such an incredible manganese content (244%), black pepper offers great antioxidant protection against free radicals and may prove useful in preventing chronic disease associated with cell damage such as cancer. The copper content of the spice helps prevent depigmentation of the iris, premature hair graying, supports immunity and thyroid gland activity. Also, being a good source of potassium, black pepper helps lower blood pressure, thus contributing to cardiovascular health. Conclusion. Although adding a dash of pepper to your favorite dish to spice it up is wholeheartedly recommended, never consume excessive amounts of spices and herbs. Too much pepper, for example, will cause heartburn, upset stomach and even irritation of the respiratory tract. Breathing in ground pepper may lead to sneezing and irritation of airways and cough.